More VAleNtiNE LoVE ThoUGhTs have arrived from Chicago for #44 and 3/8ths. Dear friends, 7/10ths (twins) and a relative, another #44, have sent their love and a family photograph to remind you they are thinking of you and miss you. I love these little sheep! cute. Does 44 travel? Thanks for your comments on my doll too. See ya soon! Yes, 44 travels. This is his first trip to Mexico. He has a new outfit -- sarape and straw hat! Handsome - don't you think? 3/8's thinks so. Letter in the mail today or tomorrow. 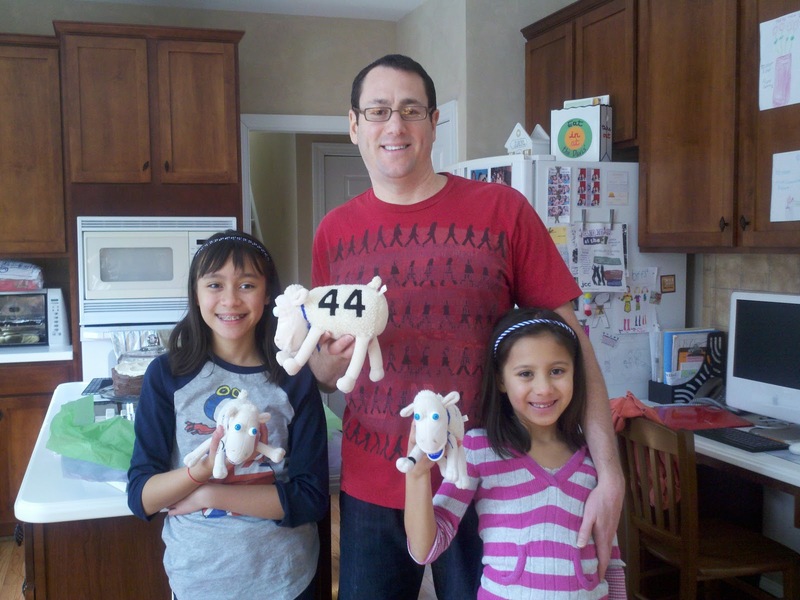 Loved the video and the fun you are having with your little sheep and friends. Aww, I have to let the kids watch this when they come home. Very sweet. Have a happy V day Lady D.
Thanks CArolyn. Happy Valentines day to you and yours. Hope you are feelin' the LoVE.